DVD: Get Up! Stand Up! 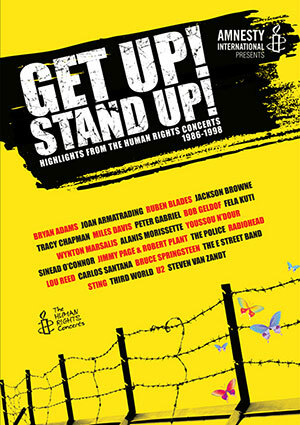 Amnesty International Presents Get Up! Stand Up! Highlights From the Human Rights Concerts, 1986-1998. Collects video highlights from the historic Human Rights Concerts, benefit concerts staged from 1986 to 1998 which placed a spotlight on Amnesty's vital work for human rights. A 2013 release from Eagle Rock Entertainment, imported from the UK. DTS Digital Surround/Dolby Surround 5.1. NTSC, region-free. 150 minutes. Net proceeds from this DVD benefit Amnesty International.